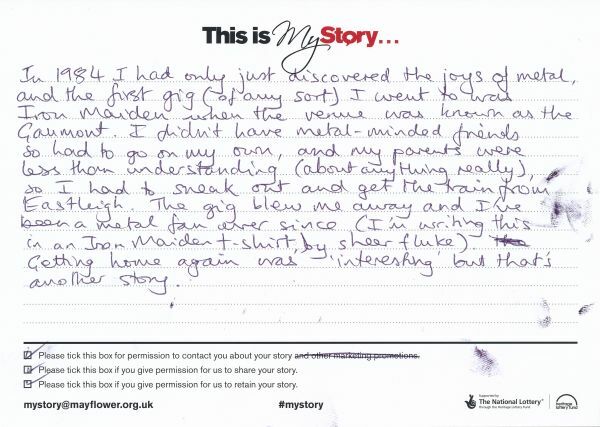 My Story card: Dave Hubble remembers seeing sneaking out of home in Eastleigh to come and see Iron Maiden at Mayflower. In 1984 I had only just discovered the joys of metal, and the first gig (of any sort) I went to was Iron Maiden when the venue was known as the Gaumont. I didn't have metal-minded friends so had to go on my own, and my parents were less than understanding (about anything really), so I had to sneak out and get the train from Eastleigh. The gig blew me away and I've been a metal fan ever since (I'm writing this in an Iron Maiden t-shirt by sheer fluke). Getting home again was interesting but that's another story.